Hotel Corallo is cared for in every detail. The privileged position and exclusive environments make it a unique structure of its kind. It has a large swimming pool, spa, convention center, private garage, rooms and suites equipped with every comfort, with balconies and loggias overlooking the sea. Admits pets of all sizes. 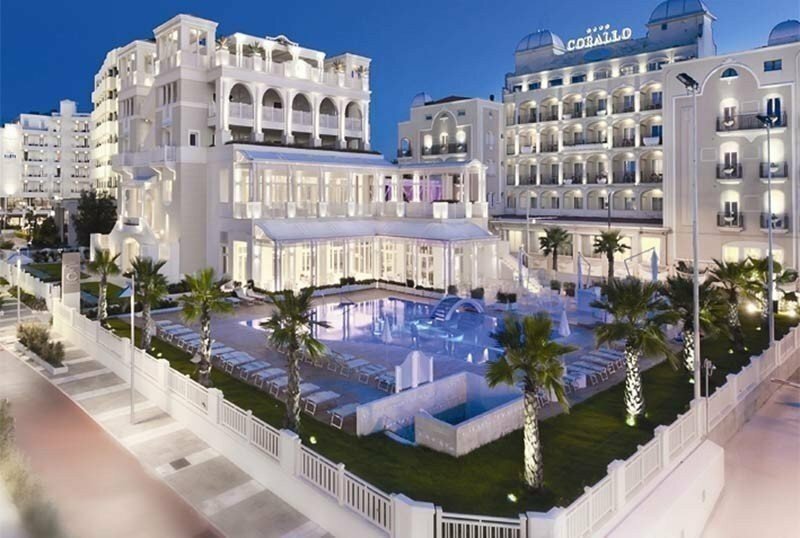 The hotel overlooks the seafront of Riccione, a few steps from the beach and Viale Ceccarini, where the shops of the best Italian brands are concentrated. Not far away are the amusement parks of Aquafan and Oltremare. The rooms are elegantly furnished and all equipped with air conditioning, direct dial telephone, safe, mini bar, LCD TV with Mediaset Premium, Wi-Fi connection. EXECUTIVE ROOM: room consisting of two rooms, living room with sofa bed and bedroom with LCD TV in every room (Mediaset Premium), direct dial telephone, safe, independent air conditioning. PARADISE SUITE: with panoramic balcony and sea view. Composed of living room (not all), living area, bedroom, bathroom with large rain shower. In the suite are available: bathrobes, slippers, toiletries, WI-FI, LCD TV in every room (Mediaset Premium), direct dial telephone, safe, minibar, independent air conditioning. CORALLO SUITE: suite with panoramic loggia, composed of two rooms (almost all) and equipped with independent air conditioning, direct dial telephone, safe, mini bar, pillow menu, LCD TV in every room (Mediaset Premium), WI-FI, shower with rain effect, bathrobes, slippers, courtesy set, in-room massage or on the balcony (on request, no extra charge). QUINTOPIANO SUITE: solution consisting of two bedrooms, each with its own private bathroom. It has a large living room with a double sofa bed and a large terrace (150 sqm) complete with: gazebo, tables and chairs, solarium space with sunbeds and outdoor shower. Swimming pool, garden, open-air porch, terrace, wellness center and Corallo Spa, congress center, private garage, american bar, roof garden with views over the coast, bicycles available (also with child seats), entertainment, beach towel, online newsstand Free. PARKING: private parking space in the garage, open parking next to the hotel. PETS: pets of all sizes are allowed. BREAKFAST: rich buffet with sweet and savory dishes, ring-shaped cake and freshly baked croissants, fresh fruit, fruit salad, yogurt, cereals, jams, butter, fruit juices, cheeses, local cold cuts, freshly prepared eggs, bacon, savory pies, bread and hot focaccia. LUNCH AND DINNER: meals are consumed in the Corallino Quattro Stagioni restaurant, with buffets rich in international and local specialties. During the week, special eno-gastronomic moments are offered, such as the fish Rustida and the Romagna Romagna evening. VARIATIONS: kitchen for celiac and vegan on request. In the hotel: children's pool, indoor and outdoor playground area, baby / mini club, strollers, pediatrician, baby sitter service, live entertainment. In the room: cribs, cribs, changing table, bottle warmer, toilet reducer, bathtub for the bathroom, night light, bedtime story, pillow case, TV with channels for children. At meals: baby food , baby menu, high chairs, bottle warmer, afternoon snack. The hotel's large pool is slightly salty and free of added chlorine, with a central hydromassage area. Next to the pool is a pleasant sunbathing area equipped with sun loungers and parasols. American bar available. In the Wellness Center & Spa you can relax in the swimming pool, turkish bath, Scottish shower, Finnish sauna, ice waterfall, hydromassage, color therapy and professional treatments of all kinds. Hotel Corallo has a Congress Center with different types of rooms equipped for conferences, meetings and business meetings. A competent staff will be able to accommodate and manage every type of meeting and event. SALA SCALE REAL: can accommodate up to 300 people and has two adjacent rooms to be used as an answering machine or backstage. SALA TRIS D'ASSI: can accommodate from 70 to 220 people, also excellent for showrooms. BUSINESS ROOM: ideal for small meetings and business meetings. 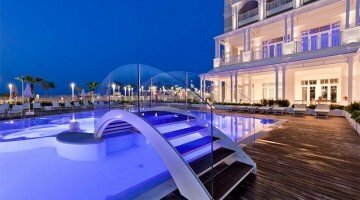 The hotel has an agreement with the beach n. 55 and n. 44. Among the services available to guests: baby club, entertainment, beach volleyball courts. and if it is bigger it has a discount of 15% ... and if there are any little brothers or sisters they will also benefit from a reduction! Spring bridges: 2 Bridges, 1 unique opportunity! In 2019 Easter, the bridge of April 25th and the one of May 1st meet to create a perfect holiday period just when the days are getting longer, the sun starts to be warmer and we have a bit 'all want to sea ... then leave the heavy jackets in the city and come to us! Mini club, swimming pool open to children, aperitifs, themed dinners, magic shows, animated fairy tales! The April 25th bridge to the sea is more beautiful! So leave the heavy jackets in the city and come to us! Every day from April 20th to 28th, thoughtful and kindly tates await the kids at the miniclub to play, dance, create, listen to fairy tales! Promotion: stays of 5 or more nights -15% on total booking! A fantastic opportunity for those who want to book a full-board holiday at unrepeatable prices! From July 27th to August 12th do not miss a fantastic opportunity for those who want to book a holiday at unrepeatable prices! Stay with us: we give one more holiday day to those who stay at least 9 nights! Parasol and sunbeds, beach towel, parking space in the garage, minibar and many other services offered!